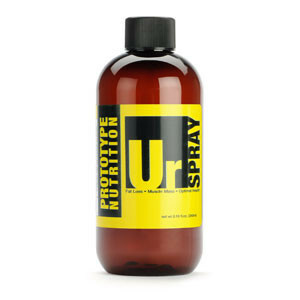 What Does Usolic Acid Do; Is it a Muscle Builder? I recently dipped into Tim Ferriss’ latest book, ‘Tools of Titans.’ In the fifth chapter of Part 1 titled ‘Healthy’, Ferriss profiles a buddy of his in the field of ergogenic supplements. His name is Patrick Arnold. He’s touted as being, among other things, the go-to guy on the topic of ursolic acid. That sounds great if you’re an overweight rat. It’d be promising if it can do even one of these things in a human body. According to Patrick Arnold, it can do a degree of these things in humans if it’s taken as a topical spray. He says that ingestible ursolic acid is all but useless as it is destroyed by presystemic liver metabolism. That might explain the dismal product reviews for ursolic acid pills and powders I’ve seen. And this is what led Mr. Arnold to develop an alcohol suspension product for successfully absorbing the compound through the skin. So does spraying an ‘anabolic mist’ onto your skin, after opening your pores with a hot shower, sound like something that will successfully augment your muscle building results? In the study abstract, ursolic acid is defined as a lipophilic pentacyclic triterpenoid. Let’s break that down a bit. Lipophilic means that it combines with or dissolves in lipids or fats. That’s interesting given that Tim Ferriss mentions it can’t be injected because it “doesn’t mix with oil” (not that I’d want to inject it anyway). Pentacyclic means it contains five usually fused rings in the molecular structure. Triterpenoid are saponins of the terpopene type, containing 30 carbon atoms. If you’re like I am, those chemical descriptions kind of make your eyes glaze over. The pertinent info we’re after is whether the stuff is likely good or bad for us. It just so happens that triterpenoids, including ursolic acid, show cancer inhibiting effects. That’s a good sign. 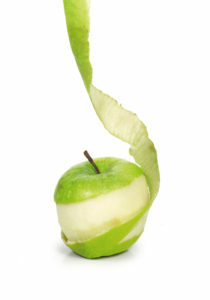 Again, the biggest natural source of ursolic acid are apple skins. However, it’s also present in basil, cranberries, bilberries, rosemary, peppermint, , lavender, oregano, thyme, hawthorn, and prunes. The potential of ursolic acid as a muscle builder arose from research into finding something to block muscle atrophy. Scientists are constantly on the lookout for natural substances that can prevent muscle wasting caused by pathogens, cancer, or aging. In their search, some decided to possibly identify such a substance with a technique called connectivity mapping. Basically, this involves comparing gene patterns in muscle cells that are atrophying with similar gene patterns in cultured cells treated with various compounds. Naturally, they can use this technique to test a lot of different compounds. Lo-and-behold, in doing this, the researchers observed that ursolic acid appeared to block muscle atrophy in the cell linings. Next, they’d see what it would do in a living body with rodent tests. Then the question is what it will do (if anything) in a human body. The rodent test is where the study mentioned above comes in. The title of the study clearly explains the results observed in the rats; Increased Skeletal Muscle… Increased Brown Fat… Decreased Obesity, Glucose Intolerance, and Fatty Liver Disease. The following excerpt sums up what the researchers had to say in the abstract of their rat study. In a nutshell, ursolic acid appeared to produce these effects by increasing the Akt/mTOR pathway, which is a crucial regulator of skeletal muscle hypertrophy. This was the implied ‘upstream’ effect. But its main “downstream” effect appeared to occur by increased cellular receptivity for insulinlike growth factor-1 (IGF-1). In 2014, a human study on ursolic acid was published in the The Korean Journal of Physiology and Pharmacology. This small trial involved sixteen weight training males being put through an eight week resistance regimen. Nine of the men received 450 mg daily of ursolic acid divided among three capsules of 150 mg each. Seven men received a placebo that appeared the same as the ursolic acid capsules, with each capsule containing 150 mg of guar gum. The ursolic acid group showed significant increase of strength and decrease of body fat compared to the placebo group. The researchers also noticed significant increases of IGF-1 and irisin in the group receiving ursolic acid. Obviously, these guys weren’t given the Patrick Arnold spray-on suspension version. If that one really absorbs better, its 249 mg per 50 sprays might outdo the 450 mg per swallowed capsules of the study. Strangely, the researchers note no significant increase of lean body mass while pointing out that body weight was unchanged in the subjects receiving ursolic acid. How does body weight remain unchanged while body fat is significantly lowered, unless lean body mass improves? Somebody will need to explain that to me. Is Ursolic Acid Worth Trying? 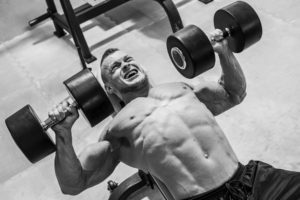 Any natural supplement – even if highly effective – can easily have its fragile benefits cancelled by excessive or haphazarly unmeasured training routines. How can this NOT be the case? Over my decades of being in gyms, I’ve seen heavy steroid cyclers get horrible results through lousy training. If a powerful drug can be overridden by ineffective regimens, imagine how vulnerable is a natural supplement. Or reverse that: Envision what a slight boost from a supplement could do if synergistically combined with a highly effective training routine.